In the ‘Eco Strokes’ painting exhibition, there are 37 paintings and just one photograph. This is a self-portrait by South Korean artist Hayan Lee. 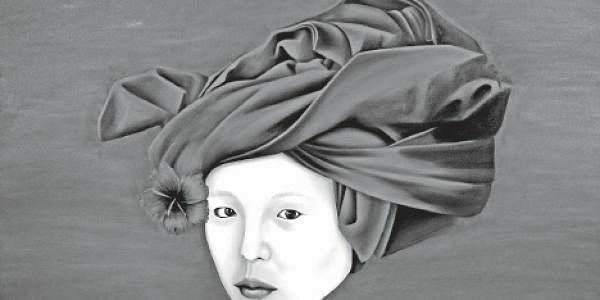 It has the narrowed eyes of a South Korean woman, looking unblinkingly at the viewer, with sensuous red lips, the head covered by a flamboyant red turban and a hibiscus tucked at one corner, just above the ear. Incidentally, the exhibition was organised by the Building Association of India. It is a prelude to the 40th Convention of the International Federation of Asian and Western Pacific Contractors’ Associations being held in Kochi. On the other hand, Kavita Singh Kale of Mumbai has done several portraits. Titled, ‘The All-Purpose Room,’ which is an acrylic on canvas, she has drawn several square panels in which men and women are standing. The women are wearing sarees, salwar kameezes, skirts, housecoats and jumpers, with names, written in Hindi, like Ameesha, Amala, Shivani and Nina. The men are wearing trousers, dhotis and Bermuda shorts, having names like Tapan, Hari and Ram. Meanwhile, CB Bahuleyan shows a nest of bird’s eggs growing around the thin rods between two concrete beams. In the distance can be seen several multi-storeyed buildings. This is an indication that even though development, in the form of buildings, seems to smash through Nature, life still goes on: eggs hatch, babies are born, and they will grow up into adults. “I have been inspired by the works of Rene Magritte [a Belgian surrealist painter],” says Bahuleyan. All in all, it is a remarkable exhibition, which grips and holds the viewer. Those who took part include Anjum Chaturvedi, Saami Atmaja, Sosa Joseph, Dedy Sufriadi, Gayatri Gamuz, T.K. Harindran, Kim Seola, Lalitha Lajmi, Lavanya Mani, Madhu Venugopal, Maneesha Doshi, Rashmi Trivedi, Rathidevi Panikker, Ritu Kamath, Radha Gomaty, Sajitha Shankar, Satyanand Mohan, Sayaka Arase, Shivani Aggarwal, V. Ramesh and Veer Munshi. The exhibition, at the Durbar Hall, concludes on September 22.